This species only occurs in the Kosi Bay area, where there is a single individual that has not reproduced since it was first recorded. This single individual represent a non-viable national population and <1% of the global population of this species, which is globally widespread and not considered to be in danger of extinction. This species is therefore not assessed for the South African National Red List, following IUCN regional guidelines on the selection of species for inclusion in regional Red Lists (IUCN 2003). In South Africa, this species occurs only at Kosi Bay. It is however globally very widespread, occurring in Kenya, Madagascar, Mafia, Pemba, Somalia, Tanzania, Zanzibar, and throughout most of the Old World tropics to Australia, Fiji and Tonga. Tidal mud of mangrove swamps, especially towards their upper limits. There is only one individual at Kosi Bay. There is no record of this individual reproducing. A possibility exists of recolonization by means of long-distance drift seed dispersal from populations outside of South Africa, but this has not occurred in over 30 years. IUCN. 2003. Guidelines for application of IUCN Red List Criteria at regional levels. Version 3.0. IUCN Species Survival Commission, Gland, Switzerland and Cambridge, UK. White, F. and Styles, B.T. 1986. 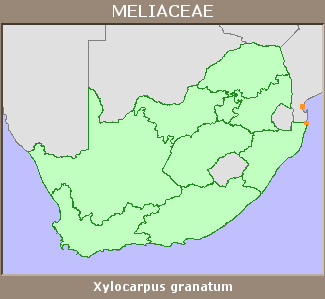 Meliaceae. In: O.A. Leistner (ed). Flora of Southern Africa 18 Part 3 Simaroubaceae-Malpighiaceae:39-61. Botanical Research Institute, Pretoria.